There can be a lot of noise on Twitter, which is why you need to know how to stand out and get your voice (or instruments) heard! The past couple of years have been transformative for Twitter. While bot surges and new data privacy laws have potentially caused a decline in monthly usage in 2018, Twitter can still boast 326 million users every month! Furthermore, the daily usage has climbed consistently with 46% of American Twitter users visiting the platform at least once a day. Not only can you find a tremendous amount of people on Twitter, but it is often easier to reach these users compared to other social media platforms. Twitter does not penalize users for sharing links to other platforms, articles etc. Twitter also allows you to post as many times a day as you would like without downgrading your content. Therefore, you are able to share thoughts, updates and chat with fans as often as possible. This platform for musicians can be informal, conversational and allows you to experiment with whichever content promotes the best engagement with fans. 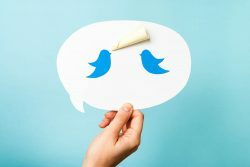 Below you will find 2019’s Twitter best practices, tips, and tricks. Dig in and start Tweeting!